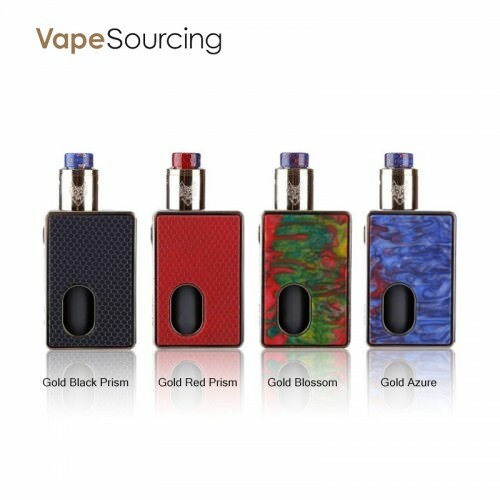 Guys, today let me show you the newest vape kit - Snowwolf O-100 Squonk Kit 100W, the luxurious design elements, is consisted of O-100 Squonk Box Mod and SnowWolf BF RDA. Powered by single high-amp 18650/21700/20700 battery, it can be fired up to 100W with power mode adjustment and compatible with Kanthal, Ni200, Ti, and Stainless Steel wires with TCR Adjustments and Memory Mode. This kit is sturdily constructed in heavy-duty Zinc Alloy frame with magnetized panels in a range of visually striking designs. What's more, the 7mL squonk bottle can be filled with E-juice and can be used to saturate the cotton within the included SnowWolf BF RDA via a bottom-fed 510 squonk pin. It measures a 24mm base and has a two-post deck with single terminal in each for a flavor-focused single coil configuration. Airflow enters via large adjustable dual airflows that can fully open for maximum customizability or with the provided tiny air slots for a MTL-orientated air channel. It will bring you a perfect MTL vaping experience. It’s so colorful that you can choose your favourite color from four kinds of charming colors. Snowwolf O-100 Squonk Full Kit are sold on Vapesourcing at the price of $53.90.